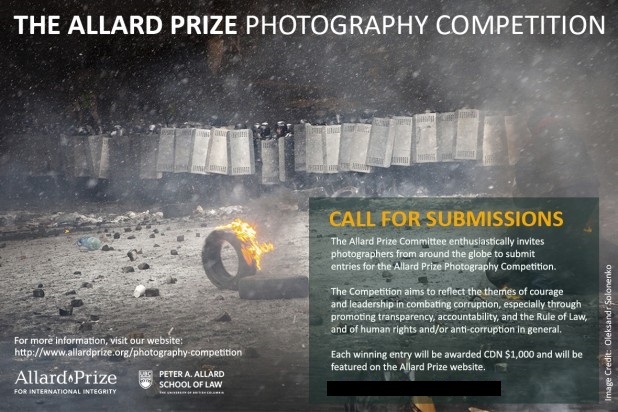 The Allard Prize for International Integrity at the Peter A. Allard School of Law, University of British Columbia is accepting submissions for the Allard Prize Photography Competition through November 1, 2017. The bi-annual Allard Prize Photography Competition, which recognizes photographic excellence reflecting the ideals of the Allard Prize, is adjudicated by the Allard Prize Committee and Maxe Fisher, Associate Professor, Faculty of Design + Dynamic Media, Emily Carr University of Art + Design. Photographers are encouraged to submit entries year-round. Entries should reflect themes of courage and leadership in combating corruption, especially through promoting transparency, accountability and the rule of law, and of human rights and/or anti-corruption generally. We also particularly welcome entries that depict corruption and human rights violations in the developed world. Entries should reflect themes of courage and leadership in combating corruption, especially through promoting transparency, accountability and the Rule of Law, and of human rights and/or anti-corruption generally. Each winning entry will be awarded CAD $1000 and will be featured on the Allard Prize website. The submission deadline is November 1, 2017 at 11:59 PM Pacific Daylight Time. 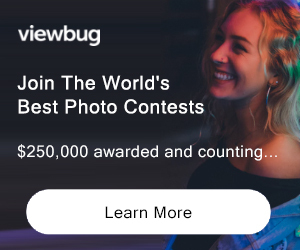 PRIZE DETAILS: Each winning photograph will receive CAD $1,000 and be featured on the Allard Prize website, with a brief description and the photographer’s name, for six months. Winning entries will be archived as a past winner on the website afterward. The full terms and conditions can be reviewed here. Not eligible to enter? - Find contest where you are. COPYRIGHT: 3 (a) Photographs that violate or infringe upon another person’s copyright are not eligible. 6 (a) By entering this Competition, each of the Entrants agrees that if he or she is one of the winners, he or she represents and warrants to UBC that he or she owns the photograph(s) and other works forming part of his or her Entry, and has the right to enter into this Agreement and to grant to UBC the licenses and other rights contemplated herein. Full Terms & Conditions: http://www.allardprize.org/sites/default/files/allard_prize_photography_competition_terms_and_conditions_08152016.pdf USAGE RIGHTS: 6 (b) By entering this Competition, each of the Entrants agrees that if he or she is one of the winners, he or she shall and does hereby grant to UBC a perpetual, assignable, non-exclusive, irrevocable, worldwide, royalty-free license to use the photograph(s) and other works forming part of his or her Entry on the Allard Prize website and in printed and other materials relating to the Allard Prize and, in that regard and without limitation, to scan, copy, modify and create derivative works of such works.